Emperor’s Kitchen Organic Dried Whole Shiitake Mushrooms are grown in Qingyuan County in a remote area of Zhejiang Province to strict Chinese Government Organic Standards. Enjoy the unique umami flavor of shiitake mushrooms in your favorite vegetable stir-fry, sauces, gravies, vegetable stocks for soups and stews and add to your Sunday morning scrambled tofu. We love to add them to our daily Miso Master Miso soup! Shiitake Mushrooms (Lentinus edodes) are America’s favorite Asian mushroom and now Great Eastern Sun is importing these delicious mushrooms as certified organic under our Emperor’s Kitchen brand! Emperor’s Kitchen Organic Dried Whole Shiitake Mushrooms are grown in Qingyuan County in a remote area of Zhejiang Province to strict Chinese Government Organic Standards. These standards require Chinese organic farms to be located far away from industry, mining, and intensive modern, chemicalized agribusiness, especially rice cultivation and feedlot animal husbandry, as well as areas of high population density. American and European Organic Standards make no such provision, allowing organic farms to produce in areas closer to urban markets to reduce ecological transportation costs. Qingyuan County is a secluded, verdant forest paradise ringed by mountains isolating the entire area not only from any major city but for most of its history from most contact with the outside world. The Chinese EPA has named Qingyuan County the most ecologically pure county of the more than 1,500 counties in all of China with the purest water and air and the least pollution. Qingyuan County presently has 82.4% forest cover. Our mushroom farms were in fact established on land reclaimed from a scrub forest zone never before subjected to cultivation with the major difference between day and night temperature necessary for the strongest, healthiest, tastiest fungus. Our organic farms use only pure natural well water. Our producer has their own scientific research station conducting organic fungus research in conjunction with the local government authorities. Company technicians guide the contracted farmers through every step, providing continuous and comprehensive instruction to the staff and quality control of the production base. Areas of special concern are technical training, raw material quality, and standardized management. All spores are produced under careful company supervision and nurtured in certified organic culture mediums. 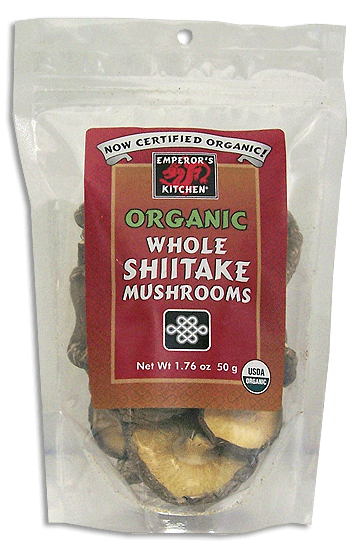 INGREDIENTS: Organic whole dried shiitake mushrooms (Lentinus edodes).